Could you please describe us your device details (tablet/PC/hybrid) that you were working on editing the form? Also, could you please describe us which text field you couldn't edit on your form? 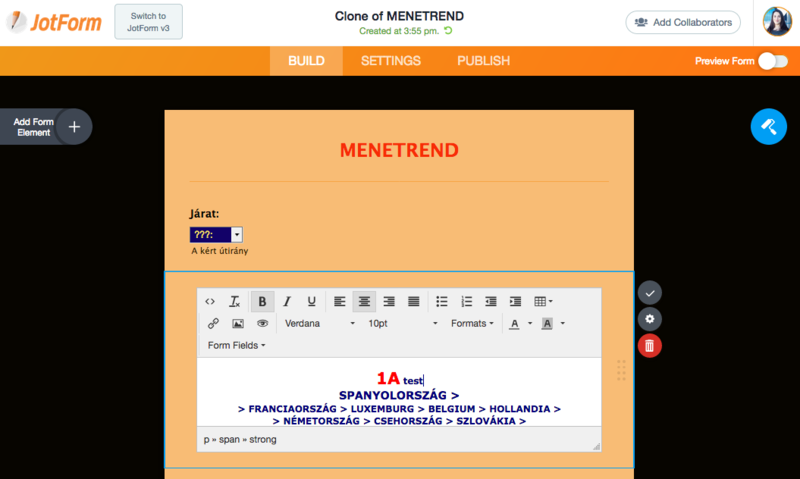 Yesterday evening I tried to edit all of my text fields in "MENETREND" form and all of them was impossible. The fields 'jumped' by clicking and the menu for editing didn't appear. Then I checked a radio button widget and moved the designated area to the text field - then editing was possible. I see in Forum, other users experiences same trouble. I am not able to detect or replicate the same issue here. As I had asked before, could you please give us your device details (tablet/PC/hybrid) that you were working on editing the form? Also, could you please check again now if the issue still persists. I have already informed our software developers related to the issue. I'm using only a laptop with Win10 Pro, 64bit, and the browser is Chrome. I never edit my forms using other devices. I will see my form and try to edit by v4 of JotForm again and send you to my results. I checked it again and now it works correctly. Now.